Barry was born in Coleraine, Northern Ireland and was the son of the Coleraine goalkeeping legend Victor Hunter, who made 471 appearances for the club. His father had gained full International honours for Northern Ireland but with Pat Jennings in his heyday, he had little chance to impress at that level. With his father having spells as manager of the first team and the youth squad, Barry’s height made him ideal as a centre half, and he rose up through their youth team. After several years with Coleraine, he joined Crusaders before signing for Wrexham on 20 August 1993 for £50,000. He went on to make 120 appearances for Wrexham, scoring 6 times and spending three years at the Racecourse Ground. 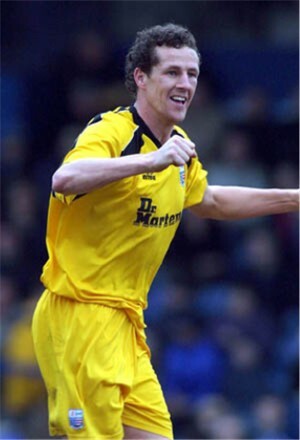 In July 1996 he transferred to Reading for £400,000 and again went on to make 100 appearances for them. In February 1999, he had a loan spell with Southend United and arrived at Nene Park on 12 September 2001 on a one month loan deal. 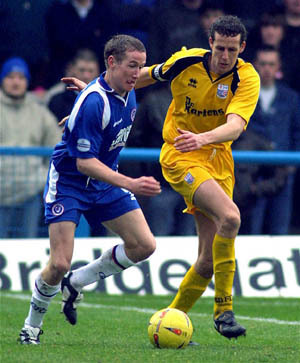 His debut did not go according to plan however, with Diamonds suffering a 2-1 defeat away to Leyton Orient, but he accepted a permanent deal on 16 October 2001 and became a key part of the side that made it through to the play-off final in 2002. He was also part of the side that won the Division 3 title, and hence promotion to Division 2 the following season. 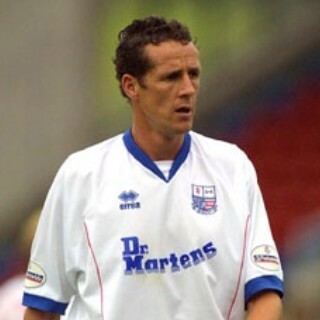 As a player, Hunter made some 121 appearances for Rushden & Diamonds and also contributed 6 goals in this period. He was named Players “Player of the Year” in 2003 and followed this up by winning the Supporters “Player of the Season” in 2004. His success as a player led to him being named caretaker manager on 10 March 2004 after the sudden departure of Brian Talbot. After only managing one win in eight attempts, he relinquished his role on 22 April 2004 as Ernie Tippett was drafted in to manage the club full time. Tippett’s reign was less than successful however and he took over again on 16 January 2005 when Tippett departed the club. Although initially in a caretaker role, he was appointed as manager on 24 March 2005. The following season, Barry took a back seat to playing concentrating more on the management role. However, the following season saw Diamonds relegated from the Football League into the Conference and on 5 May 2006, the club announced that his contract would not be renewed. Although his managerial reign was not an overwhelming success, Diamonds fans will have fond memories of the strong defender whose determination on the pitch helped Diamonds achieve their highest league status to date. He initially returned to Northern Ireland with Portadown in the summer of 2006, but returned to the mainland in October that year to assist his former Reading teammate Ady Williams as manager at Swindon Town. The appointment of Paul Sturrock during November however saw him leave after less than a fortnight. He went on to take a UEFA Coaching license, but also started scouting initially for Blackburn Rovers, Norwich City and Manchester City. He resumed playing briefly in April 2009, when he played a few games for his local side Hellenic League Division One East side Henley Town. During June 2012, Barry was reported to have agreed a deal to scout for new Liverpool manager Brendan Rodgers. He has remained at Anfield and became their chief scout, a role he still holds in 2018/19.